RAGGED OLD FLAG FANS! THIS WEEK’S EPISODE WAS NOT ONE TO MISS!!! 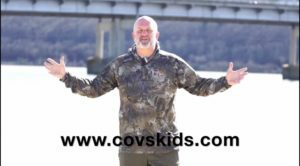 This week on Ragged Old Flag Radio I interviewed Tommy Covington, founder of Cov’s Kids, every hour of my show (5:30, 6:30, 7:30 pm) to help him with his recent fundraiser! I will attach Tommy’s and Cov’s Kids information and social media at the bottom with pictures! If you’re curious to see my full interview, I will also attach a link at the bottom for that as well. In my interview Tommy touches on the symbolism he’s been shown while on this island. He’s explained that how he feels now, is exactly how these kids feel before Cov’s Kids can reach them. He sees life going on around him, barges passing, cars coming and going on the bridge, but he is stuck. That’s how these kids that his organization mentors feel – stuck. They feel like their situation has no escape, and that’s where Tommy and Cov’s Kids step in to help them out of that state of living and thinking. IN HIS TIME ON THE ISLAND.. Tommy has endured mass amounts of sand, high winds (reaching 30mph), wind burn, sun burn, flooding, dense fog, and TORNADO WARNINGS. He lost his original tent to high winds from a storm, and his island continues to erode away by the minute. Tommy’s situation has been rough enough to the point that even the Army Corp of Engineers has recommended that he return home. However, they were unable to force him to leave due to the Arkansas River being public land. Tommy HAS NOT BEEN OFF THE ISLAND once, except during a potential tornado passing over the island when he waited in a boat dock parking lot. He has NOT been pulling a “Bear Grylls” so to say, leaving at night to sleep in a hotel bed just to return in the morning. He has done this 100% legit. Oh – not to mention running his organization’s social media and fundraising FROM THE ISLAND. THIS IS NOT HIS FIRST STUNT. Two years ago Tommy conducted another “stunt” to raise money for his organization. He built a wooden and plexiglass box on the back of a 16-foot trailer and lived in it for 38 DAYS towards his goal of RAISING $100,000. Admittedly in our interview, Tommy admits a stunt of his will never be repeated due to just how grueling they are. Though knowing Tommy, there will always be more of them. 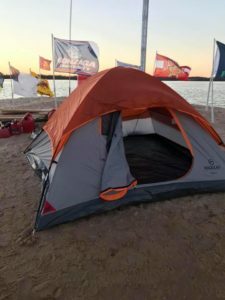 TOMMY COMMENTS ABOUT HIS TIME: I asked Tommy if he had been tempted any to return to land and stop the stunt, especially after the tornado threat and losing his tent. He and I both agreed nobody would’ve blamed him. Tommy responded saying, “I’m setting an example to these kids that we run this organization for. If I left the island what would I be teaching them? You can’t put a price on integrity”. 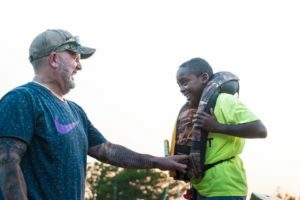 KATV ALSO INTERVIEWED TOMMY about his time on the island and helped promote his cause which gave a huge boost towards fundraising to get Tommy home! Huge shout out to them for doing that and boating out to the sandbar to score that interview. AND TO TOMMY… Thank you man for taking the time to let this college student bug you with questions, text messages, and phone calls recently in order to get this awesome story on my show! You’re an inspiration to your Cov’s Kids and generations to come brother. You rock! 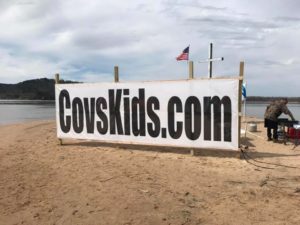 Over Tommy’s time on the island I have created a “Highlight” on my personal INSTAGRAM profile labeled “Cov’s Kids”, which I have added to as Tommy has updated us via his Facebook and Cov’s Kids Facebook. To view this series click my “INSTAGRAM” link below!